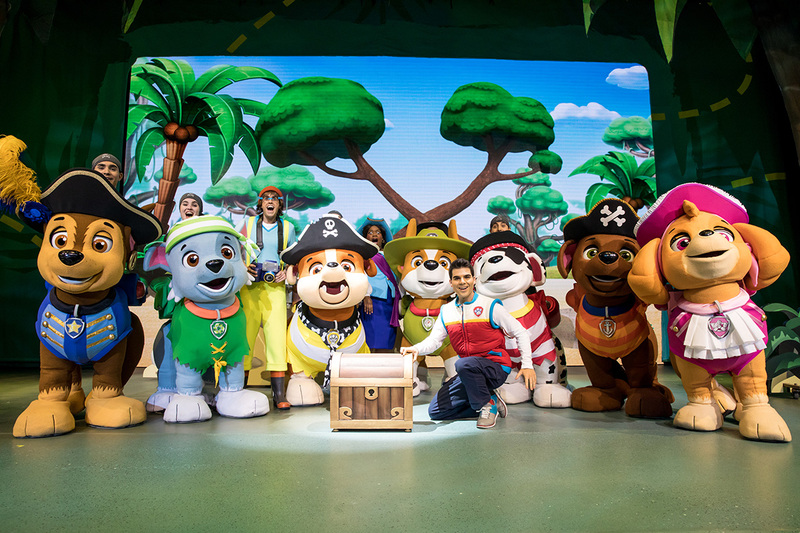 Following the success of “Race to the Rescue” last year, this summer there is a UK tour of Paw Patrol Live! “The Great Pirate Adventure”. 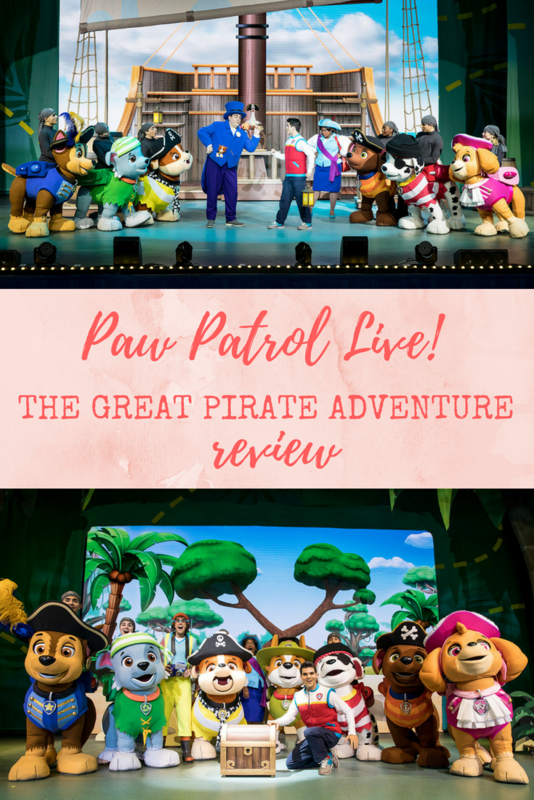 Both of my kids are Paw Patrol fans so we went along to review the Newcastle leg of the tour at Metro Radio Arena. 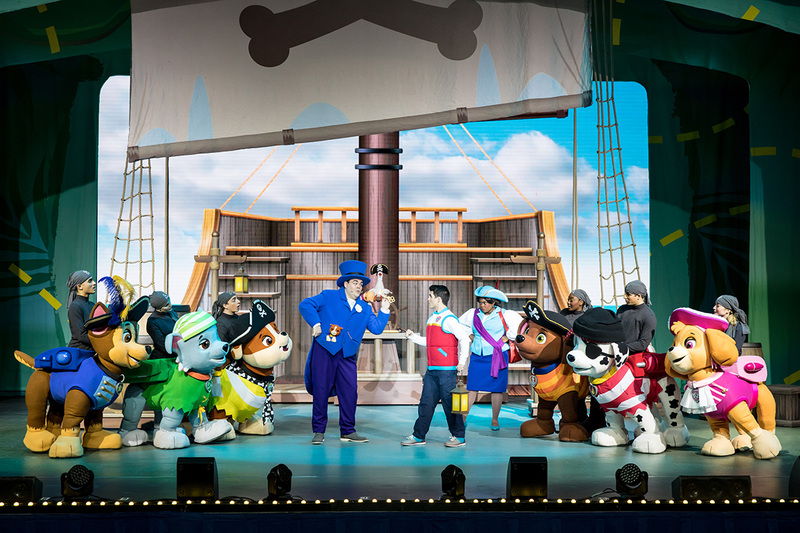 “In PAW Patrol Live! “The Great Pirate Adventure,” Mayor Goodway is getting everything shipshape for a big Pirate Day celebration in Adventure Bay. However, when Cap’n Turbot falls into a dark and mysterious cavern, it’s PAW Patrol to the rescue! Chase, Marshall, Rubble, Skye, Rocky and Zuma save Cap’n Turbot and discover a secret pirate treasure map that leads them on an epic adventure. Doors open one hour prior to show start and despite it not being fully booked, it was busy from an hour before. I would recommend arriving in plenty of time. The first half was 36 minutes, then there was a 15 minute interval and the second half was 36 minutes too. My 3 year old held interest for the first half but was bored by the second half. I would recommend ages 4 and up but obviously that depends on the maturity of your child. Lena is one of those kids that always needs to be on the go so sitting around a long time is tough for her. My 6 year old was engrossed the whole time. Prices start from £15 plus booking fee. 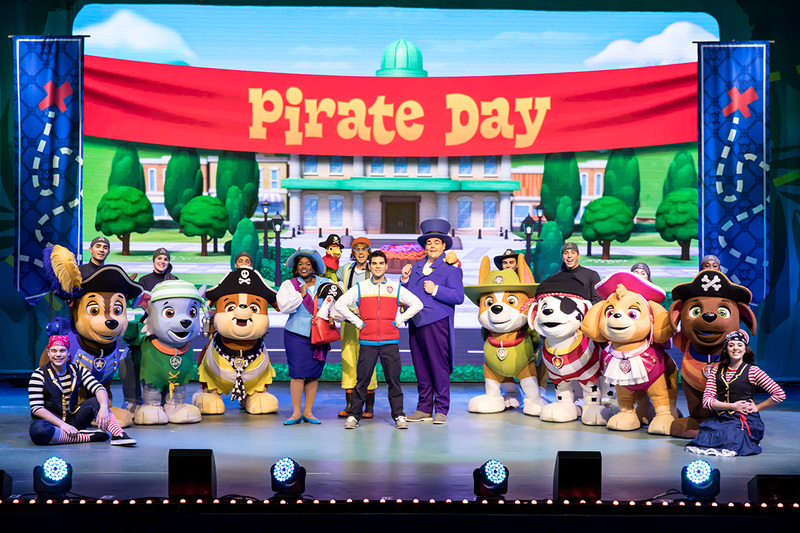 Loads of kids and adults were dressed up in Paw Patrol outfits and I wish we had too. If you don’t have Paw Patrol costumes then pirate ones would get you in the spirit too. Paw Patrol PJs would work for little ones as well if it’s an early evening show. As is often the case with these things the merchandise was expensive, as were the food and drinks prices at the arena. Small paw patrol plushes were £15, caps £10, t-shirts £15, backpacks £15, toy pirate sword £12. They had jugs of tap water at the ends of the bars which was very much appreciated on a hot and sweaty day. Arena security policies have really tightened up these days following the Manchester Arena bombing last year. They don’t let in backpacks or large bags anymore and you will be searched airport security style going in – including putting your metal objects/electronics in a basket and going through metal detectors. We saw a few people being caught out and having to go back to the car to drop off their bags so be prepared. The highlight for me was that there were lots of songs in the show and they were really catchy numbers. A dad behind me was singing and foot stomping pretty loudly (I get the sense he was into it more than his kids, good for him). The scenery was also impressive and seamless. As adults we were a bit bored (we aren’t ones for kids shows) but the kids did love it and my 6 year old was asking if it was on again the next day so we could go right back. And let’s be honest, you are going for the kids rather than for yourself (unless you are that dad!). We were a bit surprised that the pups had the actors visible out the back on the pups, rather than being fully inside the pup costume. Our 6 year old asked why the pups had ‘humans coming out the top of them’. My 3 year old didn’t comment on it though and my 6 year old enjoyed it regardless. If you have an inquisitive child then be prepared for questions about that. All in all, I’m pleased that we took them. The kids are still talking about it now and I know they would love to go back again and that’s what it’s all about isn’t it?! You can follow @PAWPatrolLiveUK on Facebook, Twitter and Instagram to see the latest news or use #pawpatrolliveuk. Disclaimer: We received press tickets free of charge for the purposes of this review. We received no instructions on what to write. For more details of my disclosure policy, please see my about page.